Magnetic monopoles, particles that carry a single magnetic pole, have long been hypothesized. Last week, researchers from the Helmholtz Centre Berlin, in cooperation with colleagues from Dresden, St. Andrews, La Plata and Oxford, claimed that they have actually observed magnetic monopoles. 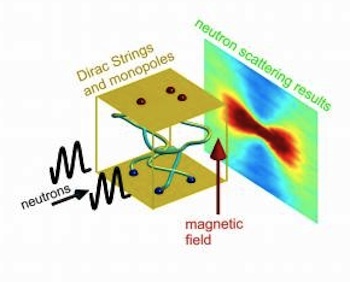 the field with magnetic monopoles at their ends. One caveat that should be attached to this result is a question about the actual observed result. This does not appear to be a discovery of a new, fundamental particle. Instead, it appears describe an exotic state of matter in which the magnetic poles are separated. We'll have to let the physicists sort this one out. In the meantime, science fiction fans have enjoyed popularizations of the idea of magnetic monopoles, and the possible uses for them. Fans of Larry Niven's Known Space stories, in particular, have been looking for shovels-full of them for space tech. A century ago monopoles had been mere theory and conflicting theory at that. Magnetic theory said that a north magnetic pole could not exist apart from a south magnetic pole, and vice-versa. Quantum theory implied that they might exist independently. The first permanent settlements had been blooming among the biggest Belt asteroids when an exploring team found monopoles scattered through the nickel-iron core of an asteroid. Today they were not theory, but a thriving Belt industry. A magnetic field generated by monopoles acts in an inverse linear relationship rather than an inverse-square. In practical terms, a monopole-based motor or instrument will reach much further. Monopoles were valuable where weight was a factor, and in the Belt weight was always a factor. But monopole mining was still a one man operation. From Nature via Physorg via Futurismic.